Every precious metal has its own story and they all perform differently for different reasons. Just like traditional assets in an investment portfolio such as property, shares and bonds the assets in a precious metals portfolio will correlate and compliment each other. Gold is the barometer of any precious metals portfolio so although most smart investors would already have an allocation of Gold and even silver, it’s the truly savvy pundits who have begun to diversify further into other products within the precious metals asset class. After some specific research coupled with our well-established understanding of the precious metals markets, we strongly believe there are some exciting opportunities at hand and we invite you to discover the beauty of PGM’s – Platinum Group Metals such as Platinum and Rhodium. Rhodium & Platinum, like silver, have widespread industrial uses and prices are strongly driven by supply and demand metrics. Platinum, the parent to the group of PGM’s (Platinum Group Metals) is actually a rare metal and was only discovered in the year 1735, many thousands of years after gold and silver. Platinum is highly valued in the jewellery industry due to its hard density and naturally white finish. It is particularly prized for its elemental properties namely its catalytic ability to speed up a chemical reaction without itself being changed in the process. Platinum is also very ductile and malleable, hence it is used in electronics and is indispensable in many industrial applications including in computer hard disks, mobile phones and glass. Fuel cells, silicones, medical devices and sensors are amongst its many other uses. Platinum is very rarely found in its pure form in nature and geographically 80% of viable platinum reserves are found in the Northern part of South Africa. It is 15 to 20 times scarcer than gold. Global production of Platinum comes in at a paltry 169 metric tons. 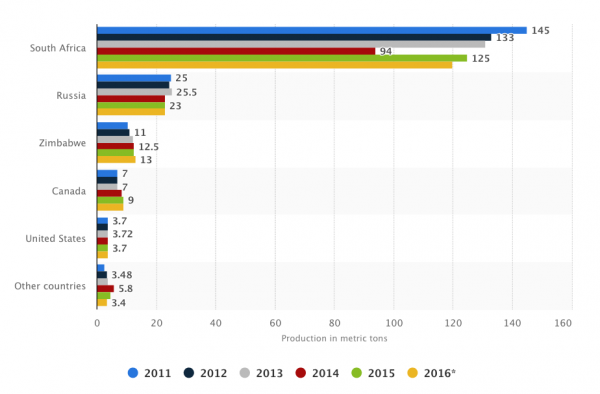 2017 was the sixth consecutive year that global platinum consumption has outstripped supply, with a predicted total supply decline of between 2% to 4%, following on from production falls over the last few years. 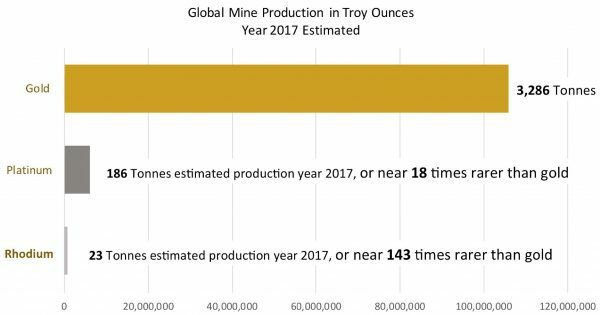 According to the Platinum Quarterly report from the World Platinum Investment Council (WPIC) 1, total platinum supply is expected to decrease by two per cent year-on-year to 7,795 Koz (kilo ounces) in 2017 as both primary and secondary supplies are recorded to decline this year. There are two factors driving platinum group metal (PGM) prices right now: Firstly, platinum and palladium are benefiting from a huge boost in demand, mostly due to their role in auto production and the huge pressure on environmental issues due to smog pollution in India and China. Jewellery and investment demand also contribute to platinum consumption. Those, too, have shown signs of increased vibrancy due to the on-going macro-economic problems and increased leverage risk and counterparty liabilities of financial assets. Shrinking and unreliable supply, coupled with firm demand, will continue to place huge pressure on driving platinum prices higher. Rhodium (Rh) is a very rare metal, the corrosive-resistant luscious silvery-white metal is considered the rarest and most valuable precious metal in the world, well above gold or platinum. The name rhodium comes from the Greek word “rhodon,” meaning rose. Rhodium (Rh) serves as an essential and highly sought after industrial metal specifically for its unique properties. The primary use of rhodium is in the automotive industry as a catalytic converter that converts harmful unburned hydrocarbons and nitrogen oxide emissions into less noxious gases. Rhodium is used as an alloying agent for hardening and improving the corrosion resistance of platinum and palladium; is used in the glass industry for the production of flat-panel glass and fibreglass and to protect precious pieces of jewellery made of silver and gold, as well as silverware. Rhodium is also the last metal to be extracted from the smelted matte through a complex series of hydrochemical and pyrometallurgical processes. This means it has the longest lead time and is the costliest to produce. As an investment vehicle, Rh has very much raised its head over the last 24 months due to extreme historical price divergences. The investment thesis is driven by a number of factors that make this rare metal a very attractive prospect indeed. Global demand for rhodium is poised to exceed output by the highest amount in three decades as carmakers and chemical companies snap up supplies. 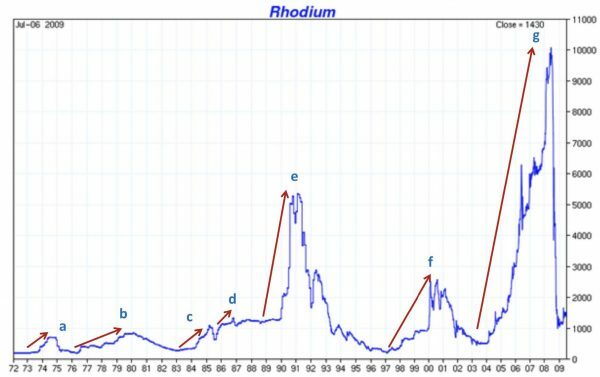 Rhodium’s price has swung from very depressed oversold levels to very overpriced levels, flowing with the economic cycles, mining production supply and cost of production, which very much drive these waves along with manufacturing adjusting their production loading and stock of the metal,dependent on the price. To give you an idea, let us look at a historical chart and the price performances below. Recognising the supply/demand pressures and the overall value proposition highlights the investment perspective. 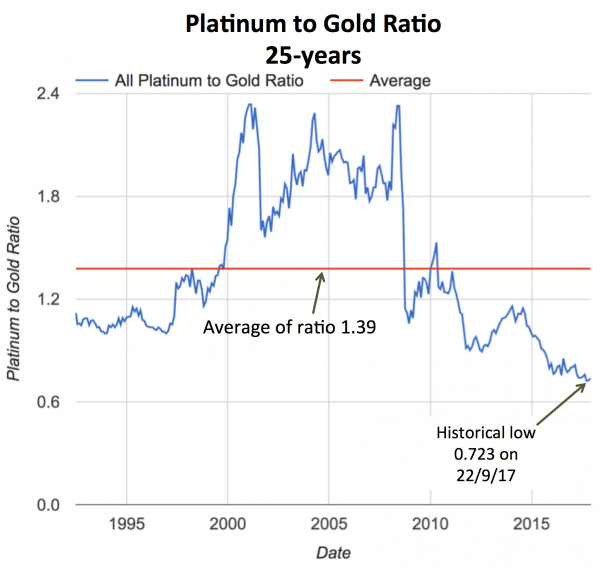 While Rhodium is not for everyone, Platinum is certainly within the realms of a low to medium risk investment profile and worthy of consideration. Disclaimer: The information contained in the charts and price lists are based on data obtained from various sources believed to be reliable by Gold Bullion Australia. However, factors beyond our control may cause variances or delays which affect the spot price or charts.